Neuroscience is providing an incredible roadmap to therapists by offering new insights into the connection between biology and mental health. But knowing how to interpret the complex map neuroscience provides has left many clinicians wondering... How do I unlock the complicated field of neuroscience to guide my client sessions? In this new, comprehensive certificate training, you'll see how neuroscience can inform why, how and what techniques can help your clients engage in healthier behaviors while improving their emotion regulation, concentration, and ability to restructure unhelpful thoughts. Join bestselling author and experienced clinician Melanie Greenberg, Ph.D., for a user-friendly presentation that shows you how you can apply the latest research to your practice. More than just the neurobiological "whats and whys," you'll also learn the "hows" of actual treatment. 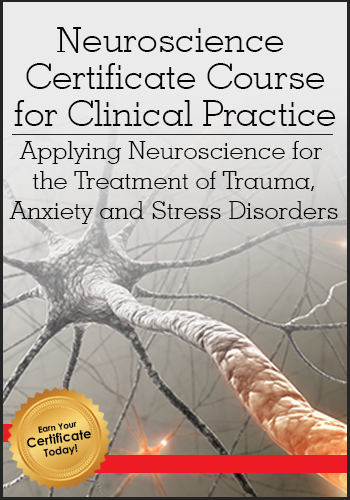 You will get step by step instruction on how to use neuroscience to inform your practice and take the guess work out of selecting strategies to use with your diverse client population — so you can more efficiently work with conditions such as anxiety, trauma, stress, depression, substance abuse, and more. Don’t wait to earn your certificate and learn how you can use neuroscience to create unique treatment plans catered to your clients needs…so you can get straight to the heart of the problem and help improve therapeutic outcomes more efficiently. Today Only 189.95 AUD — An Unbelievable Value! Begin your journey of understanding neuroscience through a foundational understanding of how the brain works. You'll then take a deep dive into the neurophysiology of the stress response, including the roles of the amygdala, hypothalamus, sympathetic and parasympathetic nervous systems and the effects of cortisol and adrenaline. In Module 2, you'll begin to look at how trauma interferes with brain connections. By the end of this module, you'll understand the differences between acute stress, major life events and chronic stressors, and the long-term effects of chronic stress on mind and body. You'll also discover tools and strategies to help you easily explain to your clients what's happening inside their body, so you can help decrease shame and self-blame. Begin Module 3 by exploring specific trauma therapies and how they impact the function of the brain and body. You'll then learn how stress and anxiety travel through the body, and discover tools you can use to help calm and support regulation. In the final module, you'll learn practical strategies to implement mindfulness and self-compassion techniques in practice. You'll also learn how these techniques affect the brain to help clients become more cognitively flexible in the face of stress. Enroll today and you'll get this FREE BONUS! It’s a fact. Life is stressful. Work, home, school — no one is immune. Good news, bad news, even no news can trigger stress. 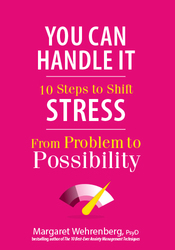 With You Can Handle It, you'll learn 10 easy steps that help shift everyday stress from problem to possibility. Other books may give you quick tips and promise success, but You Can Handle It tells you why these techniques work on the brain and gives you step-by-step directions, worksheets, and scripts that make implementing these methods feel effortless. Melanie Greenberg, PhD, is a practicing psychologist, author, speaker, and executive coach with more than 20 years of professional experience. 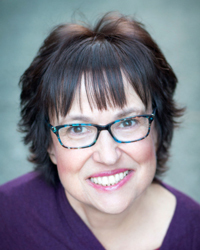 She has an active practice in Mill Valley, CA where she sees individuals and couples, teens and adults. Originally from South Africa, Melanie has a passion for psychological growth and healing. She loves to challenge, inspire and motivate. Melanie is the author of The Stress-Proof Brain (New Harbinger, 2017) – an Amazon bestseller in neuropsychology, stress-management, and health. She writes the popular Mindful Self-Express blog for Psychology Today (8 million page views) and has a substantial social media following. Speaker Disclosures: Financial: Melanie Greenberg is in private practice. She is an author for New Harbinger Publications and Psychology Today and receives royalties. Dr. Greenberg receives an honorarium from the Community Institute for Psychotherapy and National Charity League. She receives a speaking honorarium from PESI, Inc. Non-financial: Melanie Greenberg is a member of the American Psychological Association; and California Psychological Association. Watch your email for your order confirmation, and get instant access to all 4 modules of comprehensive training plus the FREE Bonus — all designed to help you effectively integrate neuroscience knowledge into your practice. Review all the course materials at your own pace and at your convenience! Click here for course objectives and outline. Instantly collaborate with other professionals on the course materials through interactive message boards. You'll be part of a community of hundreds of practitioners all focused on understanding how to apply neuroscience to clinical practice, providing valuable opportunities to share insight and experiences and to build your professional network. Complete your online CPD tests and earn up to 12.5 CPD Hours! Click here for total course CE Credit.